MSRP: $39.00 or 20.00 pounds. ​The book comes in soft cover of 144 pages in 8 1/4" x 11 3/4 " page format. 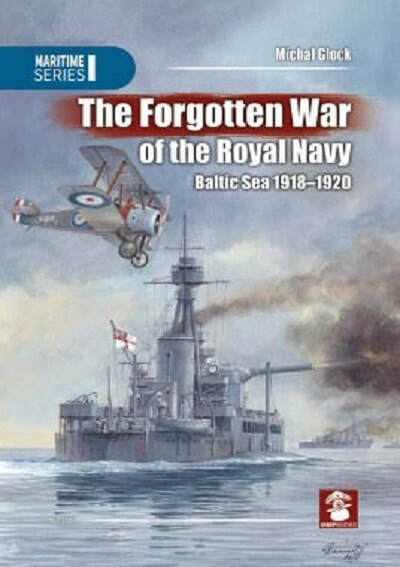 The cover art shows a British ship firing its turret gun while a British biplane flies overhead. ​It covers the little known period of naval warfare in the Gulf of Finland, sparked by the German intervention in Finland and Estonia in early 1918 and evacuation of the Baltic Fleet through ice to Kronstadt. Through the entire year 1918 the Soviet forces were preparing their bases in Kronstadt and Petrograd. The attack of the German fleet was expected, but it was too busy in operations in the west and the forces assigned to attack Kronstadt proved to be too weak. When the German Empire was defeated on the Western Front and the country was engulfed in revelutionary flame, British forces as well as sporatically Americamn and French ships appeared in the Baltic Sea. By the end of the year the Soviet fleet tried to attack Talliun, which ended in capture of Soviet destroyers, which were then handed over by the British to Estonia. All the ships envolved are described and illustrated with full tecnical specifications. Profusely illustrated with scale line-drawings (side views) and illustrations of the ships. Rarely documented aspect of World War I and post-war naval history. In 1919 the operations consisted in active blocking of the Soviet fleet by the Royal Navy and supporting land fighting. The peace treaty signed in 1920 in Tartu effectively ended hostilities in this area. This document sanctioned and confirmed the independence of Finland and Estonia for the next nineteen years. I want to thank Roger Walsgrove, Editor-in-Chief of MMP and the folks at Stratus in Sandomierz, Poland who sent me this book. Stratus is MMP's associate who prints all of MMP's books in Poland and also their own line of books in both Polish and English.